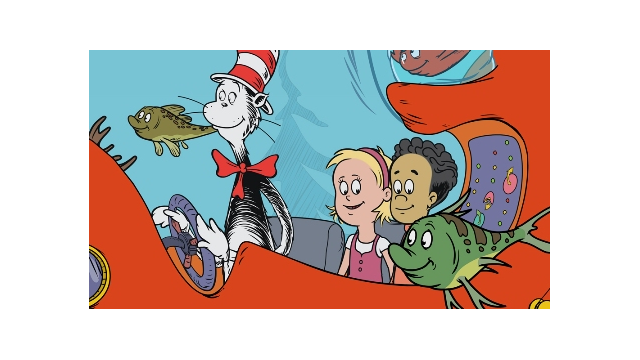 Arlington, VA – February 17, 2011 – On March 2, PBS KIDS is honoring the birthday of Theodor Seuss Geisel, more widely known as Dr. Seuss, with a two-hour marathon of THE CAT IN THE HAT KNOWS A LOT ABOUT THAT! PBS KIDS will celebrate Dr. Seuss’ 107th birthday by rhyming along with the playful Cat during two brand new episodes, “Incredible Journey/Bamboozled,” where the Cat introduces Nick and Sally to two incredible creatures, Salmon Sam and Zhu Zhu the panda, and “Teeny Weeny Adventure/I See Seeds,” in which the Cat takes Nick and Sally on two “tiny” adventures. The fun will then continue with encore presentations of two favorite episodes of THE CAT IN THE HAT KNOWS A LOT ABOUT THAT! THE CAT IN THE HAT KNOWS A LOT ABOUT THAT! has ranked among the top five programs for children ages 2 to 5 since its launch in September. Children can view these marathon episodes of THE CAT IN THE HAT KNOWS A LOT ABOUT THAT! on PBS KIDS on March 2 (check local listings). Viewers can also catch a favorite episode, “The Tree Doctor,” online at PBSKIDS.org/video. Images of these episodes are available on PBS PressRoom. Following is a listing of the episodes airing during the March 2nd Marathon Event (Check local listings for air dates and times). “Incredible Journey/Bamboozled” NEW “Incredible Journey” – Nick and Sally are playing in their homemade Thingamajigger, when the Cat arrives to take them on a real adventure! Off they go to meet Salmon Sam, who is returning to the pool where she hatched so she can lay her eggs. With the help of the Subber-e-blubber, they follow Samantha on her incredible journey! “Bamboozled” – Sally needs to find a gift for her stuffed Panda, Pammy. Who better to ask than a real Panda? The Cat takes them to meet Zhu Zhu, a giant panda who helps the kids to discover all the wonderful things you can do with bamboo. It's a perfect gift for Pammy the Panda! “Teeny Weeny Adventure/I See Seeds” NEW “Teeny Weeny Adventure” – Nick has spotted a tiny ladybug, but Sally has found an even smaller ant! And there's nothing smaller than an ant. Or is there? Cat takes Nick and Sally to meet a variety of single-celled creatures, the smallest anywhere! Nick and Sally soon learn that a drop of water holds a whole lot more than they ever realized! “I See Seeds” – Sally and Nick are going on an adventure, but how are they going to get there? Skateboard? Train? Rocketship? They just can't decide, until Cat suggests they see how trees send their seeds on trips. They follow different seeds as they travel through the air, float on the water and hitch rides on animals. “A Long Winter's Nap/The Tree Doctor” “A Long Winter's Nap” – Sally and Nick are so excited to go ice skating tomorrow, that they can't fall asleep! Cat's friend Boris the Bear can help! Off they go to the Gleep-sneep Woods to learn how Boris gets ready to take his long winter's nap. Back at home, Nick and Sally follow Boris' advice, and, with the help of a bedtime story from Cat, they quickly fall asleep. “The Tree Doctor” – Sally's little maple sapling hasn't grown any bigger! To discover why, the Cat in the Hat takes the kids to meet Dr. Twiggles. With the help of the doctor and his songs, Nick and Sally discover how trees "eat" - through their leaves and roots. They also learn that trees grow verrrry slowly. A few more years and their maple sapling will grow into a maple tree! “Maps/Termite Towers” “Maps” – Nick and Sally are pretending to be pirates. The Cat takes them on a real pirate adventure by following a treasure map! They use landmarks to find their way to a real pirate treasure: parchment paper and ink pens to make their own pirate maps! “Termite Towers” – Sally and Nick just can't seem to keep their block tower from toppling over. The Cat in the Hat takes them to meet some expert tower builders: the termites! After shrinking down to bug-size, they learn from Terry Termite how to build a tower that won't wiggle and wobble. With some engineering tips from a termite, Sally and Nick can build their block tower higher than ever before! Random House Children’s Entertainment, a division of Random House Children’s Books, is dedicated to expanding the reach of children’s stories beyond books to a variety of traditional and new media platforms. Drawing from the rich and varied library of books published by Random House, the company’s mission is to create, produce, and distribute quality projects for young people that will educate, enlighten, and entertain. Random House Children’s Books is the world’s largest English-language children’s trade book publisher. Creating books for toddlers through young adult readers, in all formats from board books to activity books to picture books and novels, the imprints of Random House Children’s Books bring together award-winning authors and illustrators, world-famous franchise characters, and multimillion-copy series. Random House is also the longtime home of the beloved and bestselling Dr. Seuss books which continue to make learning to read fun for millions of children everywhere. Random House Children’s Books is a division of Random House, Inc., whose parent company is Bertelsmann AG, a leading international media company. The primary focus of the Dr. Seuss Enterprises, L.P. is to protect the integrity of the Dr. Seuss books while expanding beyond books into ancillary areas. This effort is a strategic part of the overall mission to nurture and safeguard the relationship consumers have with Dr. Seuss characters. Theodor Seuss Geisel (Dr. Seuss) said he never wanted to license his characters to anyone who would “round out the edges.” That is one of the guiding philosophies of Dr. Seuss Enterprises. Audrey S. Geisel, the widow of Dr. Seuss, heads Dr. Seuss Enterprises as President. PBS KIDS, the number one educational media brand for kids, offers all children the opportunity to explore new ideas and new worlds through television, online and community-based programs. More than 21 million children watch PBS KIDS on TV, and more than 21 million engage with PBS KIDS online each quarter. For more information on specific PBS KIDS programs supporting literacy, science, math and more, visit PBS.org/pressroom. Follow PBS KIDS on Twitter and Facebook. Ratings Source: Nielsen NPower, 8/30/2010 - 1/30/2011, Live+7 Days national ratings for PBS and select competitive cable networks (Cartoon Network, Disney Channel, The Hub, Nickelodeon, and Nick Jr.).